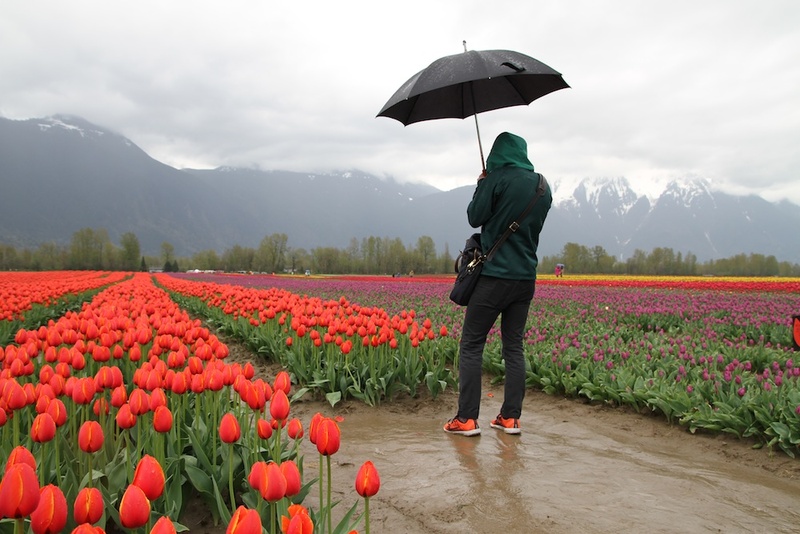 Did you know that BC has its own tulip festival? 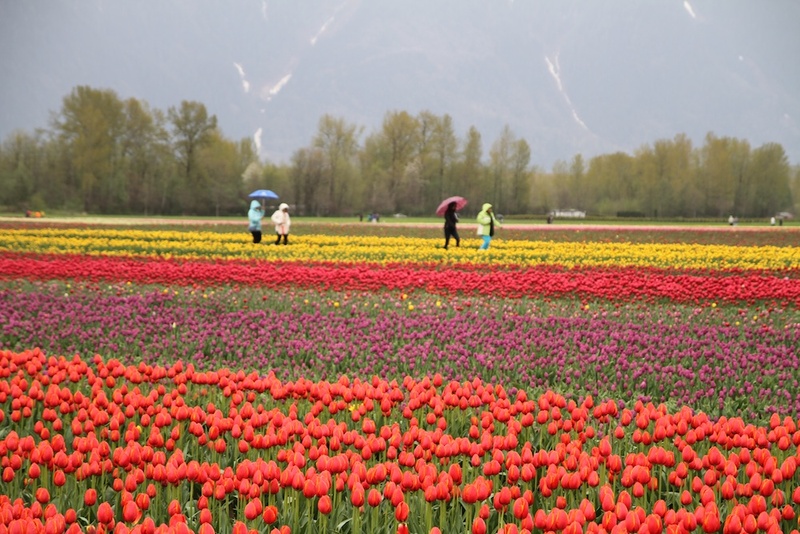 A two hour drive east of Vancouver is Tulips of the Valley, an annual tulip festival held on Seabird Island, just outside of Harrison Hot Springs in the Fraser Valley. I’ve always been curious about Tulips of the Valley, so I figured it was about time to check it out for myself. 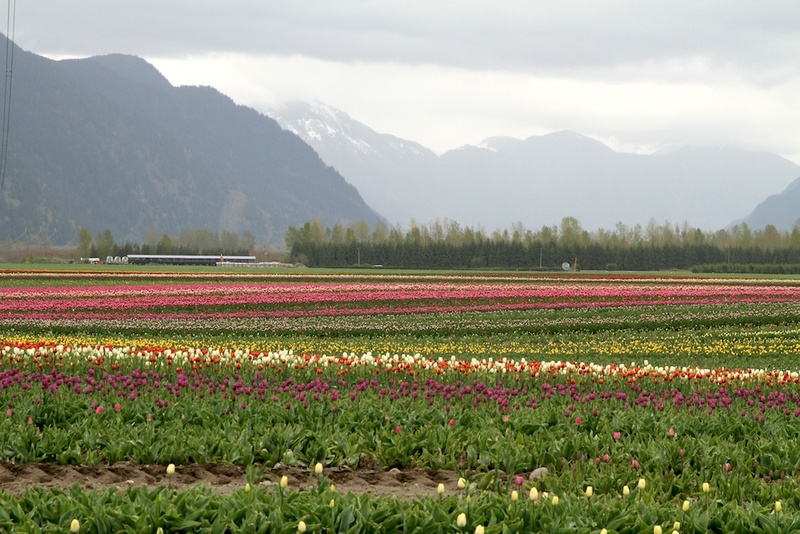 It took us two hours to drive from Vancouver to Tulips of the Valley, travelling along Hwy 7. We could have taken Hwy 1, which would have only taken an hour and a half, but we deliberately took the slower, scenic route. Once we arrived in Agassiz, instead of driving north to Harrison Hot Springs, we just kept on driving east and over the tiny bridge to Seabird Island. A few minutes later we arrived at the big gas station where volunteers wearing neon safety vests took our $5 for parking, and guided us into a parking spot. 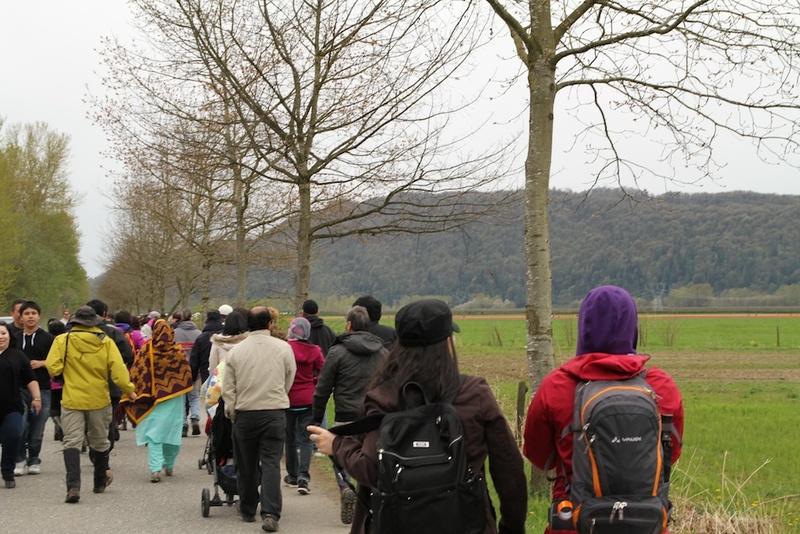 We then walked down the 1km road to the entrance of the festival, and caught our first glimpse of the tulips! 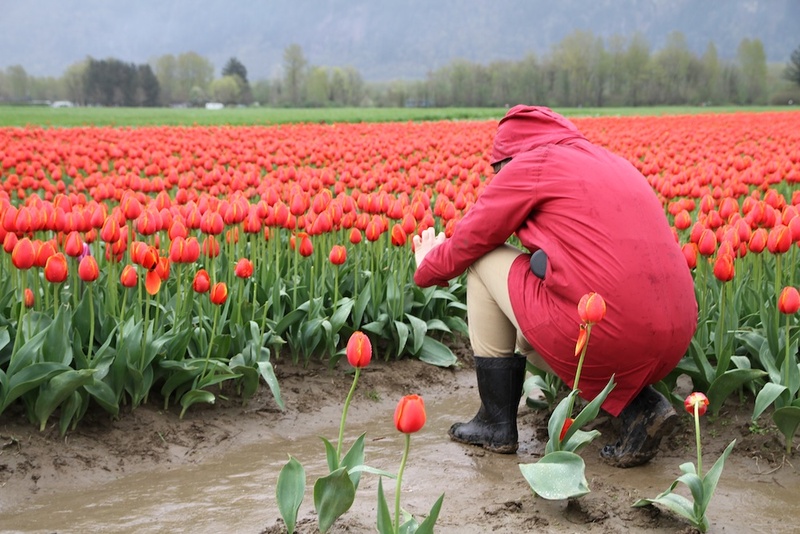 Although you can admire the tulips from from the side of the road, the whole point of coming here is to experience the tulips up close and personal! We happily paid our $3 admission fee. 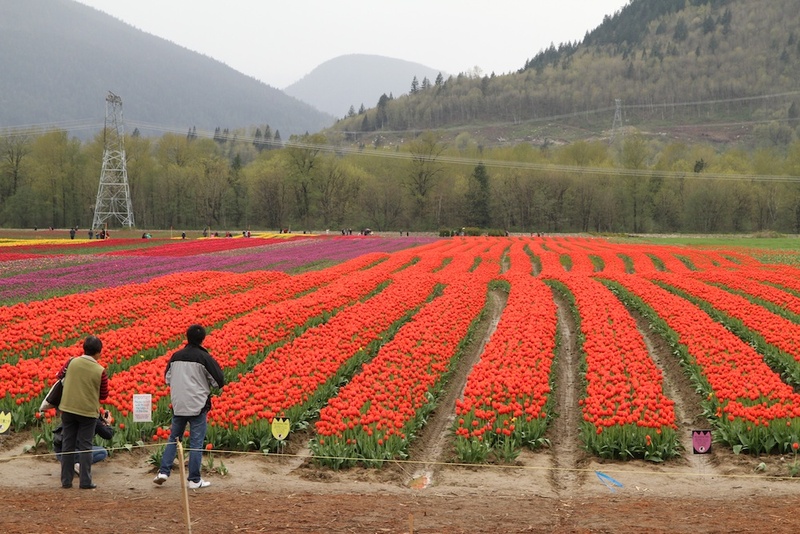 When you enter Tulips of the Valley, they have a few kiosks selling tulips (potted and cut), local honey, and food such as bannock and hot dogs. 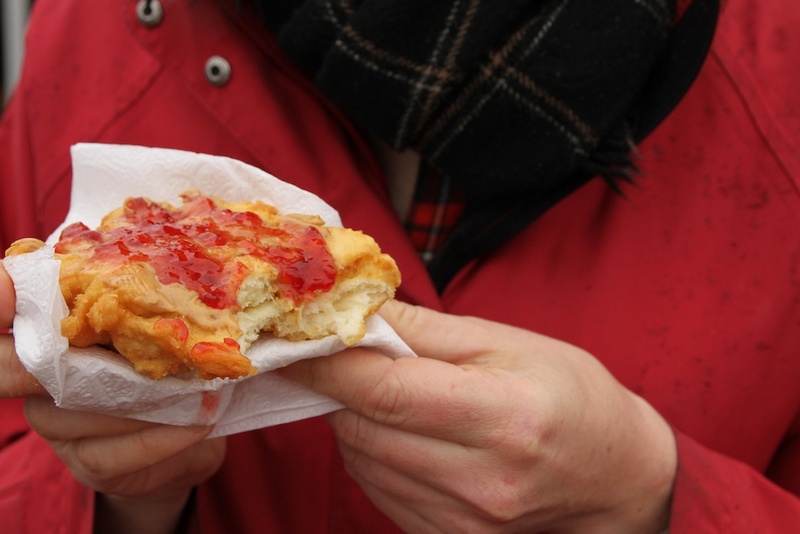 We snacked on some bannock (covered in peanut butter and jam) before venturing through the tulips. 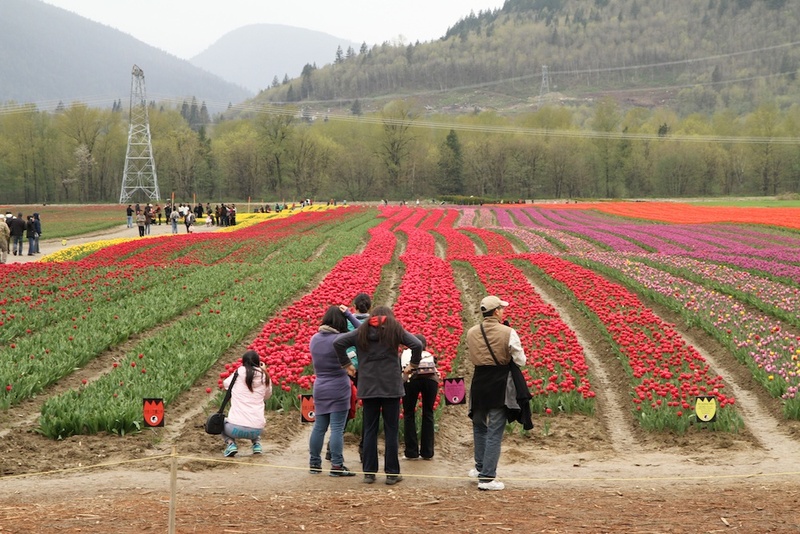 The way Tulips of the Valley is set up is that there’s a main pathway that cuts through the middle of the tulip fields. Once on the other side, you can walk around the perimeter back to the entrance. The walkways can be muddy, so you’ll definitely want to wear boots. Although it was raining on and off, the mud wasn’t too wet. In fact, it had a beautiful loamy clay quality to it, and it was fun to walk through! 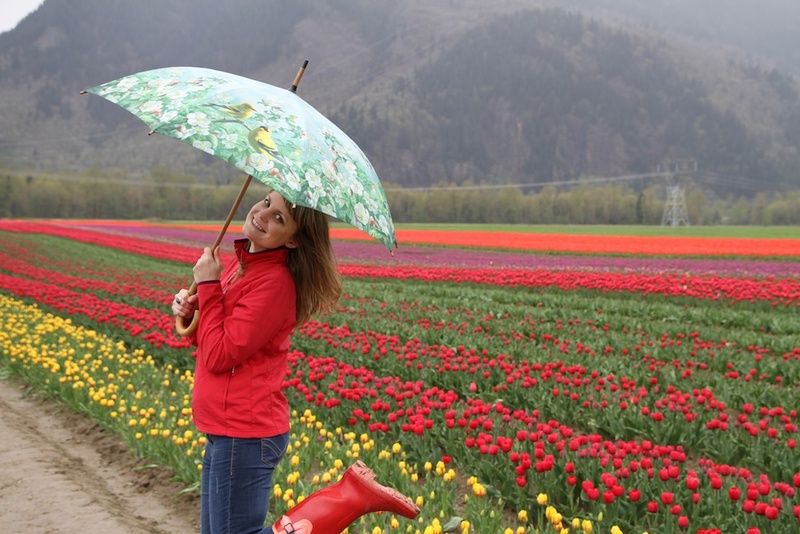 All in all, we spent about an hour and a half meandering through the tulips, enjoying the views and the beauty of the Fraser Valley. It was satisfying way to reconnect with nature and the lushness of spring. this is Kate from Tulips of the Valley. 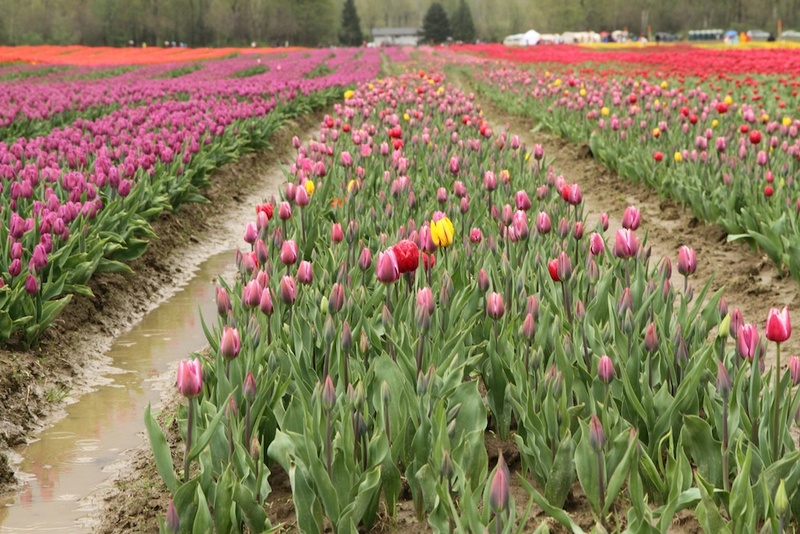 We are unsure of our own tulip festival for this year due to land issues but intend on reopening when this issue is resolved. I wanted to ask you a favor. I noticed that another website in Abbotsford is using your photo’s to advertise their new business. Would it be possible for you to ask them not to link pictures you took of my festival in their Abbotsford venture? what time did you arrive there? Morning? Afternoon? We arrived later in the afternoon, probably around 3pm. We were able to drive up and get a parking spot without a problem, so relatively speaking, I don’t think it was nearly as crowded as it could have been, as I’ve heard stories about people going there and having to turn around because the parking lots were full. If you’re trying to avoid crowds, I’d suggest going on a day when it looks like it could rain, and just bring your rain boots and a good umbrella. The tulips are no less beautiful in the rain. We went on Easter day and so glad we got there about 9am! On our way out we noticed the line-up was horrendous, even on the highway. Just want to ask question is the Tulips Valley still open until now? That’s a good question, Edith. According to their website, they closed on April 19.